Week 10 challenges have been revealed and Fortnite Battle Royale players will have one unique challenge in the set. "Fortnite Battle Royale" is already entering the 10th week of Season 5. Epic Games has been very active with in-game events and it seems that players will be introduced to the sixth season with these events. However, before players enter the next season, they will have another set of weekly challenges to complete. This will be the final set of challenges in Season 5, and players will be able to level up their Battle Pass by completing them. As was the case in the previous nine weeks, "Fortnite Battle Royale" players will receive seven weekly challenges. Three of these challenges will be available to every player, while Battle Pass owners will be able to complete all of them. Completing all seven challenges rewards players with five Battle Pass tiers, and possibly a bonus Battle Star. Additionally, completing four out of seven challenges will give players a 10,000 Season XP reward. The first free challenge will require players to search for jigsaw puzzles in basements. In order to complete the challenge, players will have to find seven of these puzzles, and no one knows where exactly they will be. The "Fortnite" developer will most likely put them in the basements of houses, and considering the fact that there are many houses on the island, this challenge shouldn't be difficult. The second task relates to foraged items. "Fortnite Battle Royale" players will have to consume 20 apples or mushrooms to complete it. Finally, eliminating 10 opponents is the requirement for the final free challenge. The last talk will be hard, which means that the reward will be 10 Battle Stars or one Battle Pass tier. The first task in this category will send players to Salty Springs. They will have to open seven chests in this area to get five Battle Stars and complete the task. Pleasant Park will also be a hot landing spot as players will have to eliminate an opponent here. This will be the first stage of the challenge and players will get one Battle Star for each phase they complete. For the Week 10 treasure map challenge, players will have to search between a covered bridge, waterfall, and the ninth green. 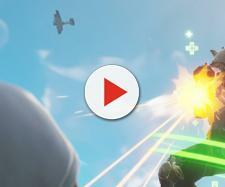 The secret Battle Star will most likely be found around the Viking Village that is located on the western side of the map. In the end, "Fortnite Battle Royale" players will be tasked with dealing damage to their opponents. Dealing 5,000 damage will be enough to complete the task.